This blog post was written by Anneliese Poetz, KT Manager for KBHN. It was originally published as a guest post on the ResearchImpact blog (Source: The “Guide of Guides” Series for Knowledge Translation) it is reposted here with permission. A couple of years ago, one of our researchers asked us for guidance for using social media for KT. We realized while searching for what was ‘already out there’ that there are a lot of guides for social media, but not all of them are targeted towards use by researchers. In collaboration with York University’s KMb Unit, we produced our first “Guide of Guides” that is a compilation of carefully selected and vetted guides for social media that are relevant. The “Guide of Guides” format resembles an annotated bibliography, where the reference information is provided for each guide along with a summary paragraph about the tool, how it can be used and why you may wish to use it. The “Social Media Guide of Guides” became the start of a series. This post serves as a “guide” to the “Guide of Guides” series. Soon after, we produced the “KT Planning Guide of Guides”. We were doing a search for existing KT planning guides because another project we were working on was to provide KT planning support for 4 key projects within the Network and we wanted to see if there was a tool out there that we could use. What we ended up doing was creating our own, that was specific to our own needs (the Hybrid KT Planning and Project Management tool). However, we had conducted an exhaustive search of existing KT Planning tools so we reviewed and vetted them for quality and relevance, and created a similar “Guide of Guides” for KT Planning. We received several requests from researchers for support and resources for creating infographics. After searching for existing guides, we realized that surprisingly there weren’t any guides for researchers about infographics, only blog posts. So, we vetted the blog posts, searched the literature and wrote a comprehensive evidence-based guide, followed by an annotated list of what we deemed were the best blog posts on infographics. Some blog posts pointed to examples of infographics, while others explained step by step how to create an infographic and what tools were available (usually free, online) for creating your own. While the content wasn’t really a “Guide of Guides” per se, we titled this product the “Infographic Guide of Guides”. We were fortunate to have one project team pilot test a draft of this guide and provide feedback before it was finalized and posted. This is the first guide that included an appendix with form-fillable fields to help research teams work through the process of creating an infographic. Finally, we produced a “Stakeholder Engagement Guide of Guides”. There are many guides for doing stakeholder engagement, and it is becoming more important for KBHN to do stakeholder engagement in a more formalized way. After searching, reviewing, and vetting guides available online, we created a similarly formatted “Guide of Guides” for stakeholder engagement that also included a form-fillable appendix to help facilitate planning. Since there are many different reasons (goals/objectives) for engaging with stakeholders and many different formats for doing so, we created a summary table at the beginning of the guide that separates the types of engagement into three tables: mostly sharing information with stakeholders, sharing and listening, and mostly listening. The list of specific formats within each category was visually coded so that the user can easily find the corresponding guide for detailed information. The KT Core may produce one more “Guide of Guides” on evaluation methods for KT. The word infographic is an abbreviation of the term “Information Graphic”. Increasingly, these forms of data visualization have used in knowledge translation as a tool for disseminating research and sharing the findings of evaluations. The overall goal of NeuroDevNet’s KT Core is to influence policy and practice using network generated knowledge. Infographics provide a quick visual representation of the main messages in research. This makes them accessible to busy; decision makers/policy makers, practitioners, researchers, students, parents and families. The rising application of infographics has been accompanied by conversations about incorporating visualization into post-secondary learning environments. Thompson (2015) discusses the concept of allowing students to create a ‘visual legacy’ through infographics. This meant bringing research projects to broader audiences by incorporating infographics. Incorporating critical analysis of infographics also allows students to analyze the information that they are receiving, and practice creating a good visualization. It is this ethic that separates a good infographic, produced with attention to research, from an advertisement or infographic that is not based on research or accurate data. It is with this in mind that we began the process of creating the first infographic with NeuroDevNet Trainees Tamara Bodnar and Parker Holman. 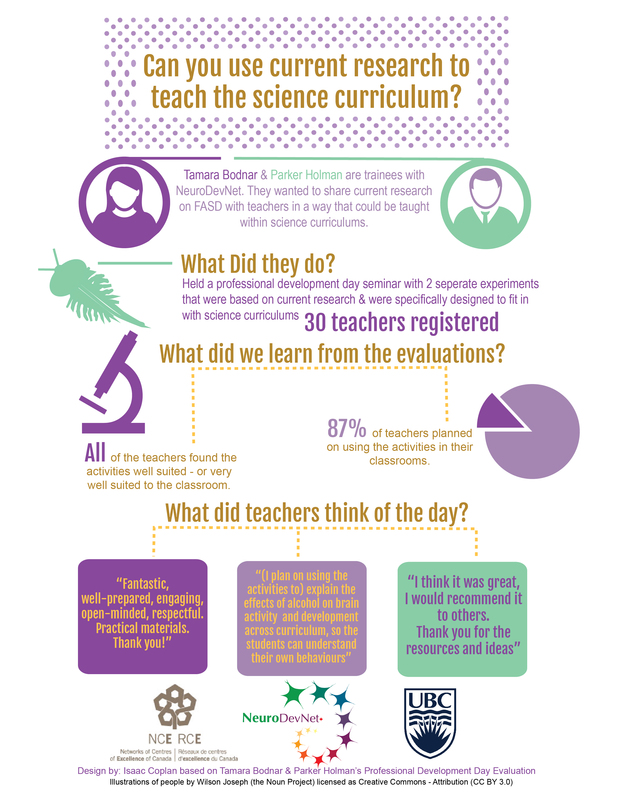 Tamara & Parker worked on a project where they introduced teachers to current scientific research that could be integrated into the science curriculum. The project was delivered during a professional development day. The following infographic was created using data collected to evaluate the professional development day. What did Tamara and Parker have to say? If you are a NeuroDevNet researcher or trainee and would like to make an infographic, contact the KT Core!